Astronomers using the Atacama Large Millimeter/submillimeter Array (ALMA) have discovered an adolescent protostar that is undergoing a rapid-fire succession of growth spurts. Evidence for this fitful youth is seen in a pair of intermittent jets streaming away from the star's poles. Known as CARMA-7, the protostar is one of dozens of similar objects in the Serpens South star cluster, which is located approximately 1,400 light-years from . This clutch of nascent stellar objects was first detected by and named for the Combined Array for Research in Millimeter-wave Astronomy (CARMA) telescope. "This young protostar is undergoing periods of rapid growth separated by periods of relative calm," said Adele Plunkett, previously a National Science Foundation (NSF) graduate research fellow at Yale University and now a fellow at the European Southern Observatory (ESO) in Chile. "This punctuated stellar formation provides important insights into the chaotic interplay within this tightly packed cluster of young stars." All stars form in dense clouds of dust and gas. As material condenses and a star begins to evolve, surrounding material forms a flattened, rotating disk that flows onto its surface. Because of the rotational energy of the material in the disk and with the help of the star's magnetic fields, a portion of that material gets ejected from the star's poles, forming a pair of jets that can be seen with radio telescopes like ALMA. In a recent survey of several protostars in the Serpens South region, astronomers were surprised to find one with brilliantly defined jets that seem to turn on-and-off with startling regularity, alternating from one to the other in possibly as little as 100 years. The protostar and its jets are oriented in such a way that the upper jet is mostly moving away from us and the lower jet is mostly moving toward us. These prominent jets offer an otherwise hidden insight into the environment of the accretion disk surrounding the protostar. Since the accretion process is obscured by the surrounding dust and gas, the outflow is an important observational proxy. However, since many stars are forming in close proximity, astronomers needed powerful ALMA observations to disentangle the chaotic outflow activity. The ALMA data reveal that there were 22 distinct ejection events associated with the CARMA-7 protostar. These outflows, which travel up to 2.46 trillion kilometers from the protostar, also are impacting the surrounding cluster and intermingling with other jets. Previous observations were unable to distinguish the outflow from CARMA-7 from the surrounding outflows driven by neighboring protostars. 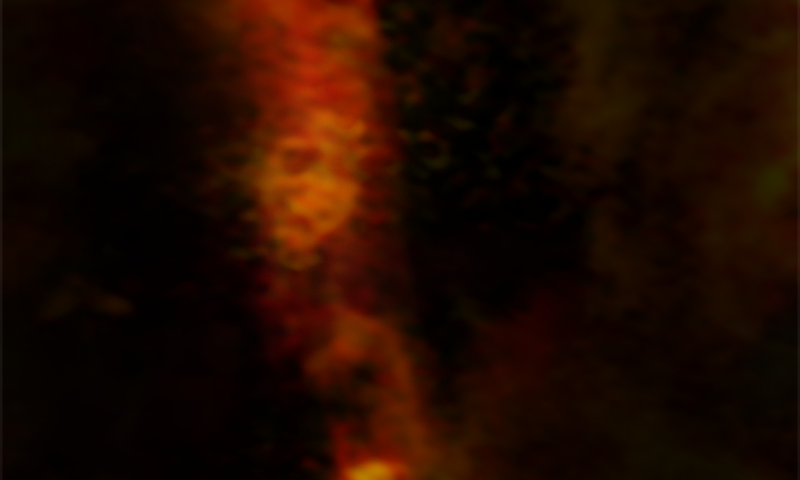 "These sources are so young and embedded and neither optical nor near-infrared light could give a complete picture of the protostar and its outflow," said Plunkett. "This shows how valuable ALMA is for observing a region like this." A paper describing these results is published in the journal Nature. "Because of the rotational energy of the material in the disk and with the help of the star's magnetic fields, a portion of that material gets ejected from the star's poles, forming a pair of jets that can be seen"
New evidence that the process is the same for quasars and stars, rapid rotation of the cyclone in the center of the body. Probably only the authors of this article can see the proto star on this picture.